Check out my very first LEGO mosaic project! I've rendered a black and white portrait of my three favorite Russian classical composers and called it "Rachvinskiev." 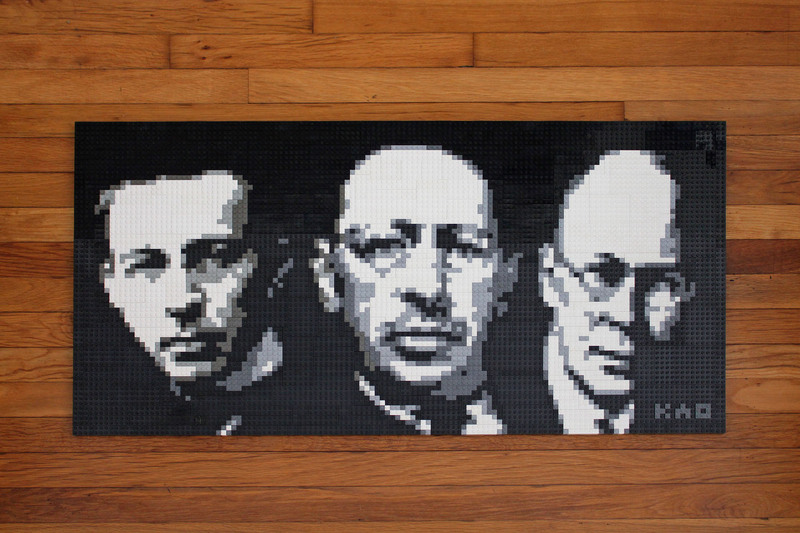 From left to right, these are the faces of Sergei Rachmaninoff, Igor Stravinsky, and Sergei Prokofiev. After about a day of planning, I performed a rigorous search throughout the entirety of my LEGO collection to muster up all of the black, grey, and white bricks I could find, and then immediately began to work on the piece. It took a few days to complete with a size of 128 by 64 bricks, or "pegs." However, I did cheat a little bit because I didn't exclusively use 1x1-sized bricks, which would have stayed true to a more traditional mosaic. I had to make a frugal decision to use some of the larger ones to cover more area. But let's just say for the sake of simpler statistics that I only used 1x1 bricks: that would yield a grand total of 8,192 LEGO pieces (with the addition of a few base plates underneath). 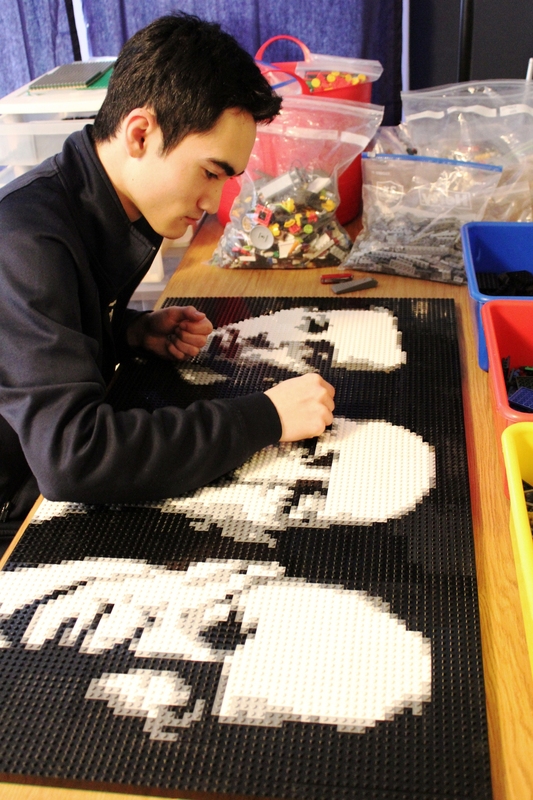 I certainly didn't realize that one LEGO mosaic would use an incredibly large amount of bricks, but the end result was definitely worth the expense. Stravinsky (middle), an influential composer during the 20th Century, revolutionized the way composers thought about harmony and rhythm. As a truly remarkable innovator, he was able to display many angles of compositional style while maintaining a distinctive identity in his music. I think this is particularly exemplified by my three favorite pieces of his, which are also his most well-known orchestral works. Between the luscious landscapes of The Firebird Suite, the puppet caricatures of Petrushka, and the violent primitivism of The Rite of Spring, the three "Ballets Russes" have opened my eyes to a different dimension of music, which is why Stravinsky will always rank among my favorite composers. The Rite of Spring is particularly notable because it nearly caused riots among the audience at its premiere in 1913 due to its avant-garde nature. While the piece is a ballet, the orchestral component as a concert piece is now widely accepted as one of the most influential compositions of the 20th Century. Prokofiev (right) was also a major prolific composer from the 20th Century. I like to think of his music as satirical and brutal: just some really enjoyable stuff. He's probably best known for his story-telling suites, like Peter and the Wolf. But I'm a huge fan of his later piano sonatas, particularly Sonatas No. 7 and No. 8, which are part of a set dubbed the "War Sonatas." Each one uniquely portrays elements of World War II through Prokofiev's expressions and clever dissonances. I'm also fascinated by his Piano Concertos No. 2 and No. 3. They've got an other-worldly effect that creates an interesting sound environment.